Yes, you’d think we’d have enough political and economic turmoil to be dealing with, without getting our knickers in a twist over some hipster clothing store and the world’s largest sports brand. On both sides of the Atlantic the Irish were up in arms. 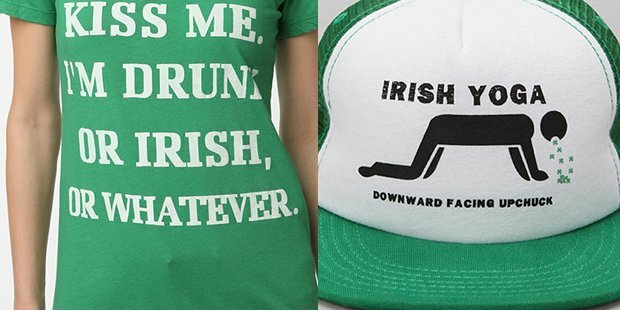 How dare Urban Outfitters defame the Irish people, they cried. But, in reality, the store’s only crime was telling the truth. Whether it is in Dublin, New York or Boston, the sight of Irish people staggering around drunk or doing “Irish yoga” on the street or sidewalk is relatively common. Next in the firing line was Nike. The sports clothing giant’s mistake was simply using color to describe one of its products. Nike was forced to apologize after naming its new running shoe the Black and Tan in advertisements. The $90 limited edition sneaker sparked fury among certain Irish communities because they linked the name with memories of the notorious British paramilitary unit that terrorized Irish citizens during the War of Independence. Outrage as St. Patrick's Day deemed too religious and renamed "O'Green Day"
But when did Irish people become so sensitive and stuck in the past? Yes, someone at Nike should have at least Googled the term before unofficially christening one of its running shoes Black and Tan, but surely it can be forgiven for not taking into account the troubled history of a small nation. Irish people have succeeded not by, as Patrick Kavanagh put it, “paddling in the pools of the past”, but by reaching outwards. Irish people have always had the resilience to put the past behind them and move forward. However, there are those who believe in an Ireland that no longer exists. Many may point to the apparent hurt caused by Nike or damage done by Urban Outfitters, but I can assure you that such outdated thinking does far more to put a dent in the Irish community’s reputation. But thankfully, the Irish nation is no longer stuck in such time warp. And neither should Irish Americans.